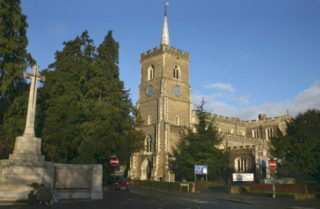 You are here: Home>Places>Churches and congregations>Memories of St. Mary's Church, Ware Choir. My father Bert Wright was a chorister in St. Mary’s Church Ware, from 1910 until he died in 1978, and throughout the 1940’s and 50’s he was also the Choirmaster. At that time the treble voice of his son Stuart was confidently predicted to be at its peak, therefore what more natural for him but to encourage his son along the same musical path he so enjoyed. During services it was the custom for ‘new boys’ to spend a few weeks sitting meekly beside the organist, presumably to soak up the atmosphere before being let loose into the choir stalls. Apparently it didn’t dawn on anyone that this wretched ‘probationer’ could not see a thing from his position, and given the limited concentration span of an eight year old, thoughts would quickly wander away from music and church matters to more secular pastimes. On promotion to the choir you were allocated to either ‘Cantoris’ or ‘Decani’ – the left or right hand side of the choir looking from the nave – I found myself on Decani and any enforced presence on the ‘other side’ always felt most strange. It was a long-standing tradition that new choirboys were ‘holly bushed’, which involved the simple procedure of being thrown or bundled into one of the bushes in the churchyard. The word would be passed round at choir practice that a certain boy would be ‘holly bushed’ on his way home. No permanent harm ever befell a victim of this practice, only a momentary loss of dignity. At this time the choir consisted of only ‘men’ and ‘boys’. What was good enough for King’s College Chapel Choir Cambridge, was good enough for St. Mary’s. The requirements for boy’s were that they attended their own short practice on Monday at 5.30, a full practice on Friday evenings, with Matins and Evensong on Sundays. During the 1940’s and 50’s we were paid for our efforts, and the reward every three months was on a sliding scale from 12/6d (62.5p) for the ‘head boy’ on each side, down to ‘half-a-crown’ (12.5p) for a new boy. Although to us this was a disappointing wage structure, access to untold riches was possible with payments of two shillings (10p) for weddings and funerals. To improve our cash-flow, we regularly offered up prayers in the hope of increasing the number of these events. To control the unsavoury habits of twenty or more acne-ridden boys and to present an air of innocence to the congregation, some rules were laid down. No talking, fidgeting or irreverence during services, and riding bicycles, or general loutish behaviour was forbidden in the churchyard, with expulsion a distinct possibility if caught on any grassed area. My father enforced these rules by the simple, but much feared, method of visiting the parents of the offending boy. Persistent offenders were expelled. It was the responsibility of men choristers to report any misdemeanours by the boys. This was somewhat unfair, as most of them were not given to setting a good example, particularly in their dependence on alcohol and nicotine, neither of which could be classed in the ‘performance enhancing’ category as far as church music was concerned. They usually arrived for practices and services smoking cigarettes or evil smelling pipes. These were never extinguished until the last possible moment before entering the old vestry. Pipes were ‘knocked out’ and cigarettes usually ‘stubbed out’ on one of the small gargoyles, positioned at a height obviously intended expressly for this purpose, on either side of the vestry door. In the 40’s and 50’s the choice of food was quite basic and little attention was placed on the importance of nutrition or balanced diets when providing meals, hence the less robust lads were prone to ‘pass out’. At one Matins I recall a boy collapsing in the choir stalls. Without any disruption to the proceedings he was carried out to the vestry, presumably given a drink of water and left there. At the end of the service, having forgotten the incident, we boys shuffled into the vestry. The casualty was nowhere to be found. His brother also a choirboy, was unmoved by the whole incident and advised everyone not to worry as he must have gone home for breakfast. During practices and services the vestry door remained unlocked – the criminal classes of the day would never consider targeting the Church. However, during one Friday evening practice scuffling and shouting was heard coming from the vestry, and the reason soon became apparent. A regular latecomer to choir practice, Bill Yorke, a big man with bass voice to match, burst through the door and into the chancel dragging a hapless youth. He had found him rifling through our coat pockets. Without further ado the snivelling intruder was marched off to Ware Police Station. In the 1940’s and 50’s entertainment was not ‘on tap’ so amusement had to be devised, and ‘Choir outings’ fell into this category. There were normally two each year. The first was a trip on one of the paddle steamers that sailed between Tower Pier in London, and Southend-on-Sea. There was no question of simply getting into cars and speeding off to EC3, it was far more exciting than that. 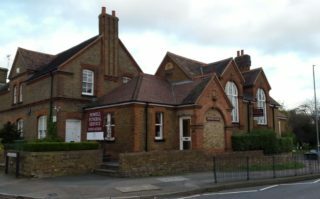 The journey began at Ware railway station very early in the morning when we excitedly boarded a steam train to Liverpool Street, and then the tube to Tower Hill. If this had been timed correctly our arrival at the jetty coincided with the arrival and manoeuvring into position of the ship, which we watched with awe. Embarkation was followed by a quick tour of the vessel conducted by one of the older boys who was only too eager to pass on his vast knowledge of seamanship gained from earlier voyages. We disembarked at Southend Pier, but the last part of the journey involved navigating the rougher waters of the estuary which had a distressing effect on some of the accompanying mothers and sisters, causing great amusement for us seafaring types. The limited time ashore had to be used wisely as did the cash we had accumulated. This strategy was forgotten by the time we reached our first destination, the ‘Kursaal’, a large outdoor amusement park, parts of which were prone to outbreaks of fire and today would not meet any safety requirements. However that was no concern of ours, we had money in our pockets, and plans to spend it. A series of hectic rides on the main attractions used up most of our finances, but to avoid the ridicule of returning with any unspent cash it was quickly squandered on cheap merchandise. ‘Kiss-me-quick’ hats, binoculars of dubious optical quality or brightly coloured ‘silk’ scarves emblazoned with a fiery dragon, especially imported from the Orient (Hong Kong) were eagerly purchased. For the more adventurous a mouth-watering dish of cockles or whelks (or both) from one of the ‘shellfish stalls’ along the promenade were quickly consumed. Not surprisingly the defence mechanism of an unsuspecting digestive system ensured these delicacies were unceremoniously returned to their natural habitat once our likely lads were back on the high seas. There were strict instructions to assemble at the pier head in time for re-embarkation, and it was a dejected group that huddled around waiting for the boat to appear. It had to be accepted that the main excitement was finished, as the return trip never did match up to the sheer thrill of the outward journey, but the exhausted group that finally arrived back at Ware station had plenty to look back on. A variation on this theme involved a coach trip to the same destination. The journey was less interesting but the main advantages were that the coach park was conveniently situated alongside the Kursaal and a longer time at Southend was possible. The return journey always gave the opportunity for a sing-song and ‘talent contest’, and as often happens on these occasions a most unlikely character ‘does a turn’. Perhaps an unknown parent takes on the mantle of entertainer, or one of the men from the choir would recite some dire speech from Shakespeare or an equally grim monologue from the repertoire of a popular celebrity of the day. Nevertheless a tired but happy group of choirboys tumbled into bed that night. There was one other treat in store for the choirboy of St. Mary’s, something just impossible to reproduce today. By some means, suitable provisions were transported to a field close to Thundridge Old Church. We boys got a bus to the ‘Sow and Pigs’ then walked. Once there, games and competitions were organised. My father and a few of the men from the choir would by some magic produce a fire and cook sausages and onions on a metal sheet precariously propped over the flames. Large pieces of crusty bread appeared and ravenous youngsters saw to it that none remained. At this point the effort of the whole exercise took its toll on the adults who lost interest in any further involvement in the event, lit their pipes and dozed. Fortunately for us a nearby river and ruined church provided enough possibilities to occupy the rest of our stay. Dams, stepping stones and rafts could be designed and built; hide-and-seek on a grand scale was undertaken. Eventually urgent calling from ‘base camp’ would bring us all back to reality. Tidying up was required and the hardware had to be carried to the road where the one car available took it back to Ware. Everyone else walked. The expectation and excitement of the whole day, tame as it may now appear, brought ‘Swallows and Amazons’ right into the world of a young boy. In spite of all these distractions it would be easy to forget that the core activity of the choir was to sing for the church services. Bert had two major influences in his musical life which the choir and St. Mary’s benefited from. Nelson Govier a former organist and choirmaster at St. Mary’s, and the Choir of King’s College Chapel Cambridge. Govier encouraged his enthusiasm as a young choirboy, taught him piano but died before completing his organ tuition. King’s College Choir set the example he continually aimed for at St. Mary’s, which led to his proudest achievement, the affiliation of St. Mary’s Choir into the Royal School of Church Music who’s guiding objective, “I will sing with the spirit and the understanding also” completely expressed his ideals. Colin Albany and Colin Weatherly were the two outstanding boy choristers at this time. To them befell the responsibility of the solo work, and both had fine treble voices. Colin Weatherly and I grew up together, spending hours walking the fields and pathways around Ware and cycling great distances on some dreamed up mission. Colin was an accomplished musician, he played piano, violin, cello and a great variety of woodwind instruments including the bicycle pump, and could get a tune from bowing a saw or twanging the ’Jaws Harp’. We were inseparable friends. Unfortunately during National Service he developed diabetes, and to his great disappointment was ‘invalided out’. Later when I returned from the Army our friendship and membership of he choir continued. Sadly in 1957, aged 23, Colin died. I was at the following Friday night choir practice when his coffin was carried into church to remain there until his funeral the next day. With his family we stood for a few moments in silence, then somehow sang ‘God be in my head’ and filed out. The book-rests fitted to the choir stalls are in his memory, as the small brass plate fixed to them on Cantoris records. While in the boy’s choir I also began a friendship with Charlie Wright (no relation). Shamefully we could not pretend that the choir were dependant on our vocal expertise, and eventually a few years after return from National Service our erstwhile exposure to the more dubious pleasures of life took it’s inevitable toll, – our voices broke for the second time !! – never to return, but Charlie remains a good companion and loyal friend. Certainly my early years in the choir helped me negotiate a reasonably trouble-free path to adulthood, gave me an idea of team spirit and the opportunity to share friendship, fun, laughter and tears, while at the same time instilling in me a lasting love of St. Mary’s Church and the music. Now, in later years, I have come to realise the significance of simplicity in the Christian belief I was taught during that period of my life – which has served me well. I was privileged to have been a member of St. Mary’s Choir. Delightful reminiscences of the church in which I was christened in 1959! Many thanks! 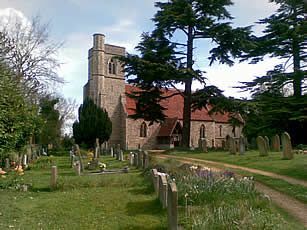 The photo image of “Thundridge Old Church” is not of the old church however, of which only the tower remains, but of the “new” church built around 1853 by Hanbury of the village.